The universe has never been a fair place, and neither is the iTMS. How else to explain the lack of some favorite artists? Three whole tracks with Eva Cassidy; can you believe it? And yet there are three (count 'em: three!) 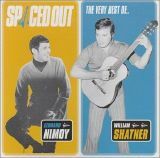 albums of whatever it is William Shatner does to songs, along with his narrations of countless Trek novels. Okay, I know that Spaced Out's value is largely (entirely?) as a curiosity. And once you've heard Leonard Nimoy sing, only then can you appreciate the wisdom of William Shatner's recitations. Good thing Mr. Nimoy has that director gig to fall back on; it's clear neither Kenny Rogers nor Dion had a thing to worry about. And one can only wonder what J.R.R Tolkien would have thought. Hey, as long as I'm ranting, how about this? Why the heck is this thing listed under Spoken Word, when The Transformed Man is an Audiobook, and Has Been is Rock? What we need is a category for Novelty. Or maybe Gifts For Friends Who Still Play D&D.